You don’t need to worry about these buttons and lists. Read through the discussion that follows only if you’re feeling comfortable, relaxed, and truly mellow, okay? 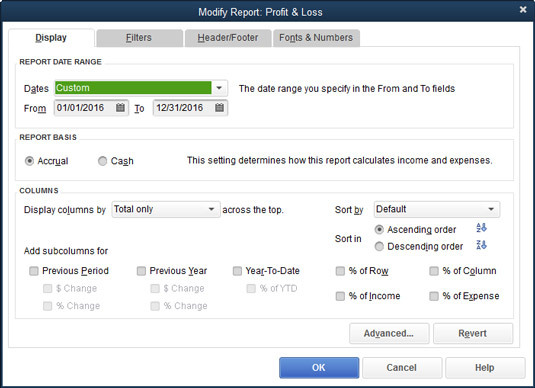 When you click the Customize Report button, QuickBooks displays the Modify Report dialog box. From this dialog box, you can change the information displayed on a report and the way that information is arranged (the Display tab); the data used to generate the report (the Filters tab); the header and footer information (predictably, the Header/Footer tab); and the typeface and size of print used for a report (the Fonts & Numbers tab). The Modify Report dialog box. 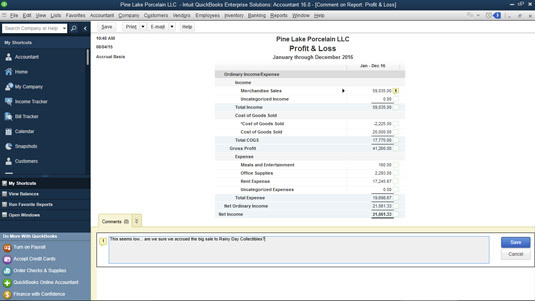 You can annotate a report with comments (a new feature in QuickBooks 2015). To do this, click the Comment on Report button. When QuickBooks displays the Comments panel at the bottom of the report window, click the button next to the reported-on value you want to comment on and then click in the Comments panel to type your remarks. To save your comments, click the Save button in the Comments panel. To save your report and all the comments you added, click the Save button in the top-left corner of the report window. To access these saved reports later, choose Reports → Commented Reports. Note that you can also print and email an annotated with comments report using the Print and E-Mail buttons, which appear in the top left of the report window. The report window with the Comments panel showing. If you work in a multiple-user QuickBooks environment and you create a customized report, you can share this report with other users. To do this, click the Share Template button. When QuickBooks displays the Share Template dialog box, name and describe the shared report using the Report Title and Description text boxes. Then click the Share button. If you do play around with the remaining buttons, you can save any custom report specifications that you create. Just click the Memorize button. QuickBooks displays the Memorize Report dialog box, which just asks you to supply a name for the customized report and assign the memorized report to a report group. After you name and assign the customized report, QuickBooks lists it whenever you choose Reports → Memorized Reports and then click the report group. You can also access Memorized Reports from the top of the Report Center screen. Whenever you want to use your special report, all you need to do is choose it from the list and click the Report button. QuickBooks memorizes the print orientation with the report, so if the print orientation isn’t the way you want it for the report, you should first change it by choosing File → Printer Setup. Select the orientation you want to memorize, click OK, and then memorize the report. If you click the E-Mail button, QuickBooks displays a drop-down list of commands that lets you email either an Excel workbook or a PDF version of the report to someone else. When you choose one of the commands that says you want to email a report, what QuickBooks does depends on whether QuickBooks sees that you have an email program already set up and installed. If QuickBooks doesn’t see any such program, QuickBooks displays the Edit E-Mail Information dialog box. If QuickBooks does see such a program, QuickBooks starts the email program and adds the report as an attachment to a new message. If you click the Excel button and select Create New Worksheet from the drop-down menu, QuickBooks displays the Send Report to Excel dialog box. You can use this dialog box to create an Excel report that holds the same information as shown in the report. Select the Create New Worksheet radio button to create a new Excel workbook with the report information and the Update an Existing Worksheet radio button to add the report to an existing Excel workbook. 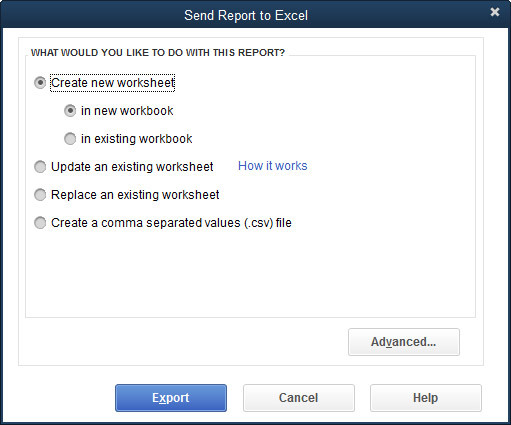 The Send Report to Excel dialog box. You can also get fancy by exporting a comma-separated values (CSV) file (these files can be opened by other electronic spreadsheet programs and by database programs) to a specific Excel workbook file, and by clicking the Advanced button to display another dialog box that lets you control how the exported information is formatted. A friendly suggestion, perhaps? Feel free to experiment with all the special exporting options. Just remember that after you export a QuickBooks report to a new, blank Excel workbook, you can also do any of this fancy-dancey stuff — special formatting and so on — there. If you want to see how the Hide Header, Collapse, and Dates stuff works, just noodle around. You can’t hurt anything. If you change the report dates, click the Refresh button to update the report. To set refresh options for reports, choose Edit → Preferences. Then click the Reports & Graphs icon in the list on the left and click the My Preferences tab if necessary. Click one of the Reports and Graphs options and then click OK.